This project began in 2008 and was funded starting in 2009 for two growing seasons. The goal of this project was to introduce a new crop for tobacco farmers in Eastern Kentucky, specifically Morgan and surrounding counties. For the 2009 and 2010 growing seasons several key aspects of sweetpotato production and marketing were evaluated on farms in Eastern Kentucky. Complementary trials were also conducted at University of Kentucky research farms. The data obtained from this project has allowed the partners involved to determine optimal production and marketing strategies for producing sweetpotatoes in Kentucky. Burley tobacco has been the primary crop grown on farms in Eastern Kentucky. Most farms are small (<20 acres) and burly tobacco provided farmers with a profitable crop (>$1500/acre returns) that could be grown with minimal inputs. Traditionally family members assisted with all aspects of tobacco production from planting though harvest and stripping. However, changes in the marketing system for tobacco have left many farmers without contracts and in search of alternatives that can be profitable on a small acreage. Vegetables represent a viable alternative in terms of profitability per acre, but many of the vegetable crops offering the highest returns also require substantial inputs of both capital and labor. Furthermore, most vegetable crops are perishable and require intense marketing to ensure that the product is sold prior to deteriorating. Therefore vegetables, in general, may not be good alternatives for tobacco, especially when growers may work off the farm and not have sufficient capital or marketing expertise to ensure success. Unlike tomatoes and other high-profit vegetables, sweetpotatoes are a crop that would be a good alternative for tobacco farmers. Sweetpotatoes require relatively low inputs (with the exception of the cost of slips) in terms of management and labor. They can be grown using bare-ground production techniques, and utilize already existing tobacco transplanting equipment. After planting the require some of the lowest inputs of all vegetable crops. Harvest can be done in a one-time manner and sweetpotatoes are a relatively long-storing crop when cured correctly offering the ability to market to several channels. Sweetpotatoes are also in-demand throughout Kentucky giving growers the ability to start small and sell their product through retail outlets. Despite requiring less management than other vegetables there were still several important questions that remain regarding sweetpotato production in Kentucky. What varieties are best suited to growing conditions here, should they be irrigated, what harvest methods work the best, are there appropriate low-cost curing and storage solutions, and what marketing channels are profitable for growers. The methods used to achieve each objective varied. Early in the project several growers and advisers toured Jones’ sweetpotato farm and Strickland Bros. equipment in Bailey, NC. Mr. Jim Jones, proprietor, was extremely generous with his time and showed the groups around the farm allowing Kentucky growers to learn from a successful grower. After the initial trip to North Carolina our growers transplanted over 100,000 slips in 2009 and more than 150,000 in 2010. It was expected that more than 200,000 slips were going to be planted in 2010, but several growers did not want to increase production acreage. Yield data of three varieties, Beauregard, O’Henry, and Covington were collected at several farms in Eastern Kentucky (2009 + 2010 reports). Plantings of a given variety were fairly large (>1/4 acre). Yield data was obtained by choosing three-15 foot plots of each variety in each planting, harvesting and weighing roots. Data obtained from University research-farm plots was collected from four-50 foot plots of each variety. In 2010, 11 varieties were trialed at a University research-farm and Sarah Fannin’s vegetable farm. In addition several growers tried different planting spacings at their farms. Yield data for different spacings was not collected. However each grower was consulted regarding their results with each spacing. Sweetpotatoes were irrigated at Fannin’s vegetable farm and at University research-farms and yields compared to non-irrigated plots. Irrigated plots during 2009 and 2010 at University research-farm sites were approximately 150 feet long with four replications of ‘Beauregard’. Yield and cull data was collected. A sweetpotato flip-plow was purchased by the Morgan county extension office and compared to a traditional potato plow for ease of harvest. Slip production trials were conducted and a slip production demonstration was conducted at a University-research farm site in 2010. This demonstration proved that our growers could cost-effectively produce slips. In 2011 a slip production trial was planned to be located at Mr. Kieth Hall’s farm. However record-rain falls in April and May prevented us from getting in the trial locations until early June. It was decided that data from a slip trial conducted 2 months late would not be appropriate for growers and the trial was not conducted. In 2010 a low-cost curing method using straw and burlap was trialed at two locations. Essentially a “curing mound” was formed with temperature and humidity sensors placed in the mound to monitor changes in conditions compared to sweetpotatoes cured in boxes. Samples of sweetpotatoes were then stored for 6 months, weighed and evaluated for disease monthly. Growers were encouraged to market through a variety of methods including wholesale, on-farm retail, farmers-market retail, events/festivals, and produce auctions. During the annual sweetpotato school held in late winter in Morgan County, KY these market options were discussed for their pros and cons. Prices obtained by growers were then used to develop realistic budgets. The most suitable variety of sweetpotato for Kentucky growers in Beauregard due to yield, quality, days to maturity (90 days) and availability of slips. Other varieties that performed well and are recommended include O’Henry, Hernandez, Covington, and Japanese. Irrigation is not required to grow sweetpotatoes in Kentucky at a commercial level. In two years of trials irrigation did not significantly increase marketable yields of Beauregard. However if choosing not to use irrigation, plants should not be planted on tall “hills”, but instead on flat-ground. Growers who did not irrigation and planted on raised beds in the historic drought of 2010 saw significantly yield losses. For large-scale operations selling to wholesale markets, where high quality is essential planting on hills is preferred. Therefore for growers selling to a wholesale market it is still recommended to have access to irrigation equipment in case of historic drought conditions Irrigation did improve stand establishment if dry conditions were encountered after transplanting. Optimum plant spacing for Beauregard sweetpotatoes is 10-inch in-row spacing with 42-48″-spacing for row centers. In-row spacing greater than 10-inches results in too many extra-large (cull) sweetpotatoes. Closer row spacings do not inhibit yields, but create harvesting problems. When using single-row harvesters at a 36-inch spacing, one row must be picked up before the next row is dug, otherwise the tractor will crush the harvested product. This slows down the harvesting process. Curing using the mound-method will increase humidity and allow for fewer temperature fluctuations during curing. However, long-term (> 3 months) storage benefits were not observed with this method over curing sweetpotatoes in boxes in an unheated barn. However more study is warranted as decreasing the variability of curing conditions should benefit growers. 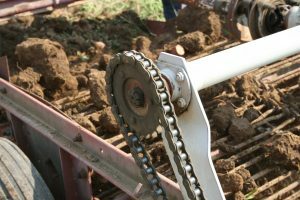 A flip-plow method was found to be superior for harvesting sweetpotatoes compared to a chain-digger. This method reduced damage to the skin of freshly harvested sweetpotatoes. However, using the flip-plow required growers to be more precise in row placement as it was much easier to cut sweetpotatoes in the ground with the flip-plow than a chain-digger. Chain-diggers are preferred when growers have multiple root crops to harvest. Growers chose several marketing outlets. Direct retail sales were preferred by growers producing 1 acre or less. Generally, sweetpotatoes were sold for $20-$24 /40 pound box in a retail setting. Most farmers producing < 1 acre could sell their entire product within 3-4 weeks on the retail market. When producing 350-400 boxes/acre this equates to gross returns of >$7000/acre. On the wholesale market growers have received between $16-$18/box when selling to regional grocers. This has been profitable for those growing 1 acre or more. Returns from produce auctions have been highly variable for growers. Produce auctions typically offer prices between wholesale and retail. However providing a consistent product throughout the growing season is generally required to ensure good prices. When sweetpotato growers try to sell large quantities of product over a short period of time prices have been low. Prices have reached $16/box, but typically are in the $10-12/box range. Numerous outreach activities have occurred including: an annual sweetpotato school in Morgan county, UK College of Agriculture Videos (http://www.youtube.com/watch?v=1Mwa_1jKkoI), field-day extension programs, county-level meetings, and a sweetpotato production guide which is currently being proofed by the University of Kentucky Department of Agriculture Communications. A DRAFT version of the completed guide is attached. This guide will be available in-print and online and will utilize the information gained from this project to introduce future growers to this crop. The results of this project have allowed for a thorough analysis for production and marketing strategies of sweetpotato production in Kentucky. More importantly we have determined that sweetpotatoes are a reasonable alternative for tobacco farmers in Eastern Kentucky. The number of farmers in the Eastern Kentucky Sweetpotato Growers association has varied from 15-27 during this trial. Based on the results of this project growers from other regions in Kentucky have begun to grow sweetpotatoes on a larger (2-3 acre) scale. This is a profitable alternative crop for tobacco and the results of this research have allowed the participants to outline the most efficient production and marketing strategies for them and future growers. Enterprise budgets for sweetpotatoes have been prepared for Kentucky, assuming typical yields, markets, drip irrigation, and input rates. Revenues and costs are summarized in the budget below. Growers are encouraged to use this framework to estimate their own returns, breakeven costs, and sensitivity of returns to changing prices or other variables. Returns to land, capital, and management under fairly pessimistic market/input cost conditions would be around $740/acre; a conservative measure of around $2,895, and an optimistic scenario of $3,775. Other financial decisions that could impact profitability would relate to the scale of operation. Larger growers can capture scale economies associated with growing their own slips, buying input costs in bulk, and setting up curing facilities on site in an effort to manage costs and market opportunities. Farmers in the project area were at first unsure of the potential of this crop. However, after the success of the first trial year, several growers decided to join the E. KY Sweetpotato growers association and produce the crop. Many farmers have chosen to continue to only grow 1 acre or less of the crop, not because of lack of success, but because it is profitable on a small-scale and they make enough money from retail sales that they have decided not to scale up though they could if they wanted to. The ability to create a production guide will allow this project to reach many more farmers after the project. The primary area for further study is post-harvest storage using low-cost methods. Although most large-scale producers have state of the art storage facilities, the capital for these facilities is too great for many small farms in Kentucky. There has been discussion to build a cooperatively used facility in Morgan County Kentucky. However, the facility must be able to serve multiple uses in addition to sweetpotato storage. Further research on low-cost engineering solutions for sweetpotato storage are warrented.